The term buffet originated from the French sideboard furniture where the food was served. It eventually became applied to a system of service. In the second half of the 20th century after the Swedes had popularized the “smorgasbord” in New York, “buffet” became popular in the English-speaking world. Nowadays, the word is fully accepted into the English language. In a buffet, meals are served by placing the food in a public area where the diners serve themselves. Buffets are offered at various places including hotels, restaurants and many social events. Buffet restaurants normally offer all-you-can-eat food for a set price. To give you a wider idea about buffet, we’ve gathered some of the best all-you-can-eat buffets in the world. Imperium is a grand all-day dining buffet restaurant in hotel Jumeirah Zabeel Saray in Dubai, UAE. It serves a wide range of an international cuisines for breakfast, dinner and weekend brunches in an elegant and opulent settings. The regular buffet breakfast and dinner starts at AED 160 ($44). They also have themed nights offering a taste of different cuisines from around the world on Saturdays through Thursdays, starting at AED 250 ($68). The famous Elegant Friday Brunch offering French Braserrie starts at AED 330 ($90) with its Classic Brunch up to as high as AED 2500 ($681) with its Royale Brunch. Sterling Brunch is an extravagant buffet restaurant located in Bally’s Las Vegas Hotel and Casino. It has been serving Vegas visitors for 30 years. It is a weekend brunch buffet which is opened only on Sundays from 9:30am till 2:30pm. It is famous for serving endless pours of Perrier-Jouët Champagne and unlimited American Sturgeon Caviar. Price is $85 per head plus tax. The Hechi World Kitchen Restaurant is one of the best buffet restaurants in Europe when it comes to food, service, value and atmosphere. It is a unique all-in cuisine with live cooking located in the city of Antwerp in Belgium. It serves sushi and European and Asian dishes starting at €19.5 ($22) to as much as €30.5 ($34) for two hours of dining. Dining can be extended for a rate of €4 ($4.5) per person per hour. Rodizio Rico is a Brazilian restaurant with branches in The O2, Birmingham and Islington in London, UK. It offers true churrascaria-style, offering eat-as-much-as-you-can for £26.50 ($34) a head, or £19.50 ($25) for vegetarians. Diners are given a card which is red on one side and green on the other side. Once ready for the meat service, just turn the card green side up and the Passadores will start carving you with succulent meats from their large skewers straight onto your plates. When you are already satisfied of need a break just flip the card to the red side. Feast is an award-winning signature buffet restaurant at Sheraton on the Park Sydney, Australia and by far, the best in the continent. 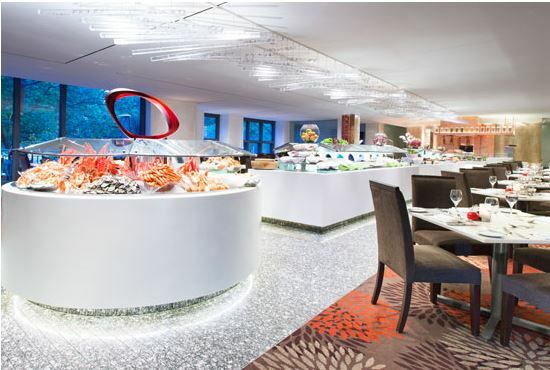 It offers a contemporary dining concept with the renowned International Seafood Buffet. Price ranges from $79 up to $99 per head. Inside their kitchen are 20 different nationalities that make the diversity of flavors immense.